The degree needed to become a music therapist is a bachelor’s, but licensed therapists will need a master’s or doctoral degree. The American Music Therapy Association (AMTA) is the official organization that approves music therapy degree programs. The AMTA works with colleges to set curriculum standards and content, which covers the musical and clinical foundations of music therapy. Upon graduation, students are ready to take the Music Therapist – Board Certified (MT-BC) exam which is offered by a separate organization called the Certification Board for Music Therapists (CBMT). Upon graduation, students become officially credentialed MT-BC music therapists. Candidates for the MT-BC exam must be graduates of an accredited program that conforms to the AMTA’s standards for music therapy clinical and academic training. The CBMT’s website offers self-assessment exams, bibliography lists, the exam candidate handbook and an AMP test center map. Current MT-BC holders must take a re-certification exam every five years and provide documentation of at least 100 continuing education credits. The MT-BC exam contains 150 multiple-choice questions, 20 of which are non-scored pretest questions. The first part of the MT-BC exam deals with referrals, assessments and treatment plans. For example, there are questions about how to properly identify client responses to different musical styles, elements and experiences. There are questions about treatment planning, such as how to consult with current clinical research and other health professionals. The second part of the exam deals with treatment implementation and termination. There are questions about how to properly develop therapeutic relationships, provide beneficial musical experiences and achieve therapeutic goals. The third part of the exam contains questions about treatment documentation and evaluations. There may be questions about how to gather, analyze and evaluate treatment data. 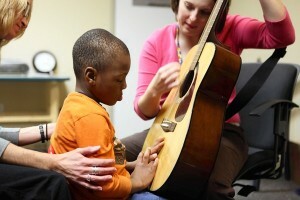 Degree programs will train students how to apply the highest professional standards and the latest music therapy techniques. They will know how to synthesize music therapy research, assessments and knowledge to provide quality, results-driven therapeutic sessions. Courses will cover the mind-body connection, which will foster the skills needed to enhance wellness and creativity, and appropriate technologies for music therapists, which will explore music and adaptive software programs. Many programs offer demographic specific courses that focus on children, older adults and diversity groups. There are also plenty of psychology classes that explore the relationships between music and psychiatry, psychotherapy and neuro-science. Music therapists must have demonstrable skills regarding behavioral assessments, case management and patient documentation. They must plan and organize customized events and programs for individuals and groups. Music therapists wear many hats and must encourage patient participation, develop monthly schedules and oversee activity budgets. Music therapists need administrative skills to balance productivity and documentation needs as well as interpersonal skills to work with diverse clients and cultures. To sum up, the basic degree needed to become a music therapist is a bachelor’s degree, but it is highly recommended for students to pursue a master’s degree in music therapy.